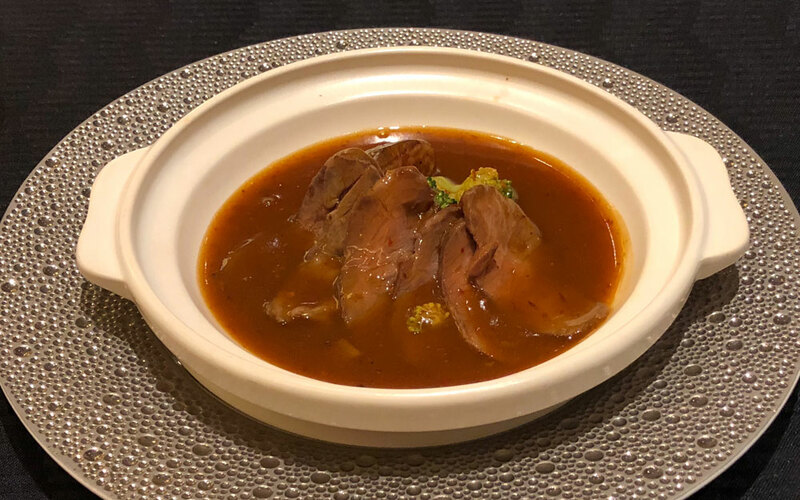 Szechuan Restaurant Chin: A Restaurant by Chen Kenichi, Iron Chef Chinese Does Chin Kenichi's restaurant cuisine reign supreme? This article is part of a series where the Tofugu team visits Iron Chef restaurants, pitting them against each other in some kind of Iron Chef sequel. Come back and see new Iron Chef restaurant reviews, and (coming soon) a final ranking of them all! Viet and I had high hopes for Chin Kenichi (Chen Kenichi, in the US), the only Iron Chef from the original series that battled through all six years and 309 episodes. We both had grown up watching Iron Chef almost religiously, and Chin—with a record of sixty-six wins, three ties, and a win percentage of 72.6%—was one of our favorites. He always seemed like he was having fun, and he made a lot of mabodōfu (some things never change). Cooking is love. Cooking without love is no good. But all this cooking didn't actually start with Kenichi-san. 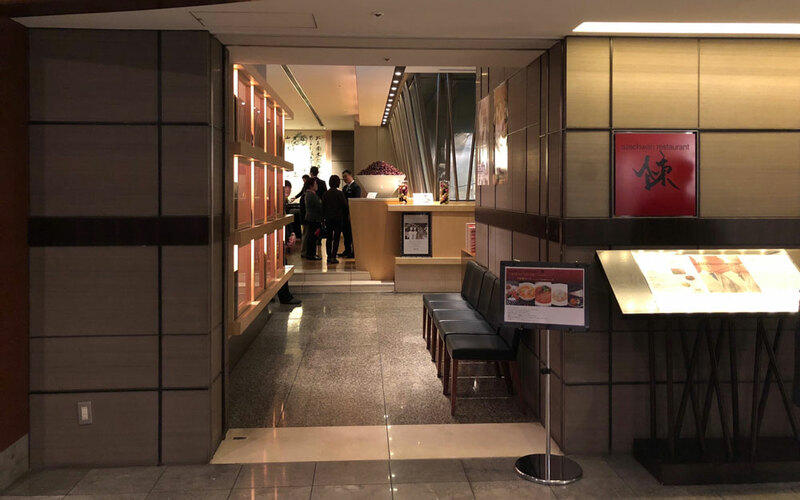 His father, Chen Kenmin, opened the first Szechuan restaurant in Nishi-Shinbashi, Tokyo, in 1958 (though it's now closed). He later opened a couple other restaurants, and is known to be the person who popularized Szechuan cuisine in Japan. His motto and philosophy was「料理は愛情。愛情のない料理はダメよ。」(Cooking is love. Cooking without love is no good.) It's no wonder his son became an Iron Chef, carrying his father's torch (though originally, he wanted to be a baseball player). The particular restaurant we went to opened in 2001. It was the first of four that are a part of the "Szechuan Restaurant Chin Group." 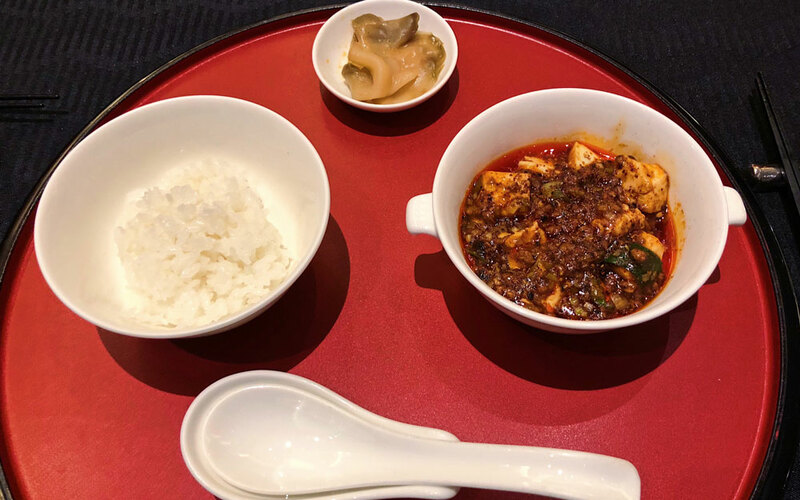 Their goal is to help customers enjoy "full-fledged Szechuan cuisine," and they try to "offer dishes that use seasonal ingredients from different genres with Szechuan's various seasonings." We were, of course, very much looking forward to it. 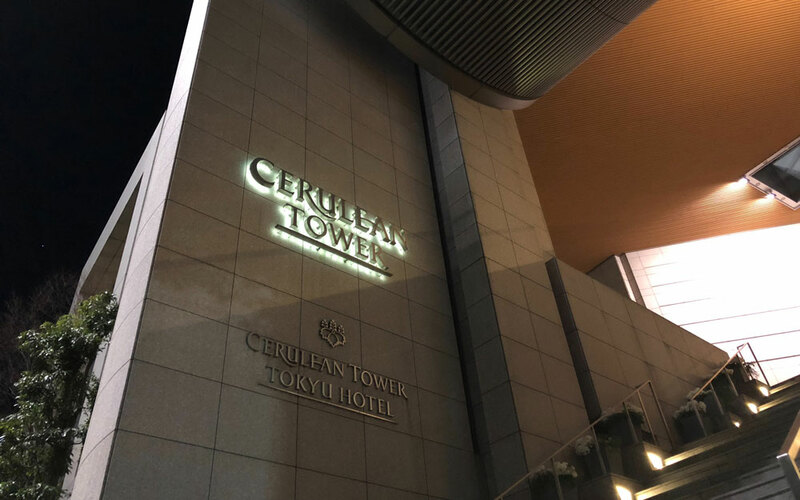 To get there, we took a train to Shibuya Station, then walked to the (somewhat) nearby Cerulean Tower, where Szechuan Restaurant Chin awaited us on the second floor. The whole building and the restaurant itself had a fancy vibe. Our reservation was early, something like 5:30 p.m. We were the only people there at the time, though it steadily got busier as the hours went by. On your left as you enter is a wall of display cases. Inside are various things, but the first thing they want you to notice is the awards. Showing off achievements is either a good or a bad sign—we weren't sure which yet, but this is an Iron Chef we're talking about! It's going to be award-worthy, right? We were seated in typical fancy-restaurant fashion (very courteously) and given two menus: one Chinese/Japanese and one Japanese/English. As with all the Iron Chef restaurants we went to, there were a few options for set meals. 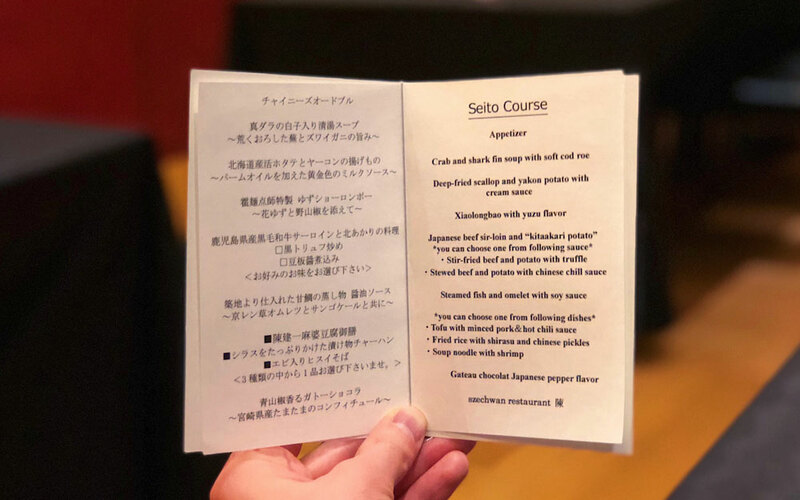 We chose the middle-priced Seito Course, and various optional items. Choosing the middle-priced course was something we tried to keep consistent throughout our Tokyo Iron Chef Restaurant Battle Royale. According to a Facebook post, this course "consists of meals that have various flavors and smells that only the Szechuan cuisine can express, and also lets you enjoy the umami of Japanese ingredients." After ordering some Chinese liquor-based highballs, we put in our food order. The chefs—who you can see when they defrost the windows at 7:00 p.m.—got to work on our food. Are you ready to eat along with us? I'll take you through each course item, and then reveal the verdict and price at the end. 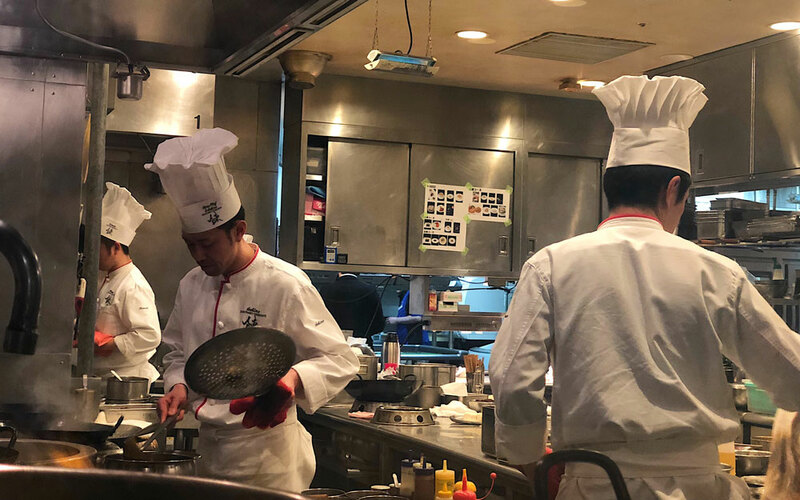 This course "consists of meals that have various flavors and smells that only the Szechuan cuisine can express, and also lets you enjoy the umami of Japanese ingredients." The first item on the menu is the "appetizer." It turns out, this was several things, including some fried fish, lobster, and more. It was okay, but a little bland for what we expected from Szechuan-style food (spicy, bright, and with a lot of peppers). 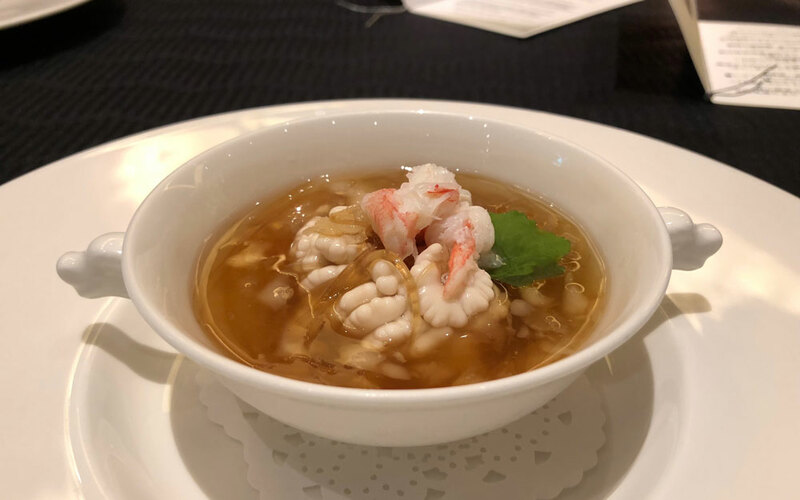 Next we had "crab and shark fin soup with soft cod roe." Morally, I'm against shark fin soup, but all set meals came with it. This one had almost zero shark fin and a ton of soft cod roe, which was fine by me because it was the highlight of the dish. Soft, smooth, and a fishy-without-being-too-fishy taste. Other set courses go heavier on the shark fin. The most expensive course, for example, gets you a "whole" shark fin. I had heard that a lot of places don't use real shark fin anymore, but it seems they're still doing the real deal here. 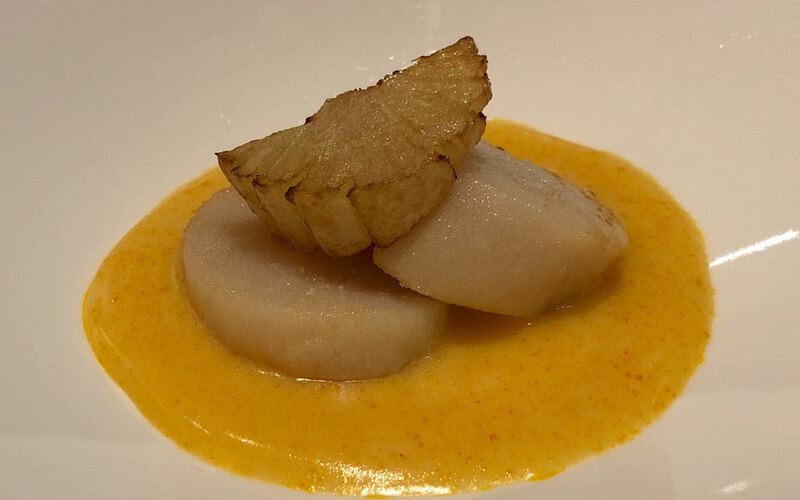 We finished up, and the waitstaff cleared our bowls and plates, then brought us our next dish: "deep-fried scallop and yakon potato with cream sauce." You may be thinking that I just misspelled "Yukon," but yakon (or yacón) potatoes are a real thing. They come from a perennial daisy found in the Andes, with a texture and flavor that's more like jicama than potato. Again, this was another good dish, but nothing more. This was the third "doesn't feel like Szechuan food" thing we got. We still had a ways to go, though, so we were trying to hold our judgment until the end. Our fourth dish was "xiaolongbao with yuzu flavor." Since the name xiaolongbao is both plural and singular at the same time, we wondered out loud if we would get one or more. Spoiler: we got just one. There was a tiny dab of yuzu koshō on the side, next to the lemon. We put it on the xiaolongbao, and plopped it in our mouths. Yuzu-flavored sauces burst forth from this little round hot pocket, and the koshō was surprisingly spicy. Finally, the spice we were craving! Well, not quite—it was the kind of spice that disappears as quickly as it hits you. Very, very good, but still lacking that "Szechuan" feeling. For our next plate, we had a choice between two things. I got the stewed beef and potato with Chinese chili sauce. Viet got the stir-fried beef and potato with truffle. I was hoping mine would be spicy (it had chili sauce in it), and I probably would have thought it was if I were seven years old. Though the flavors were good without being special, the spice was barely a tingle in my mouth. Viet's was the better of the two options, we both agreed. 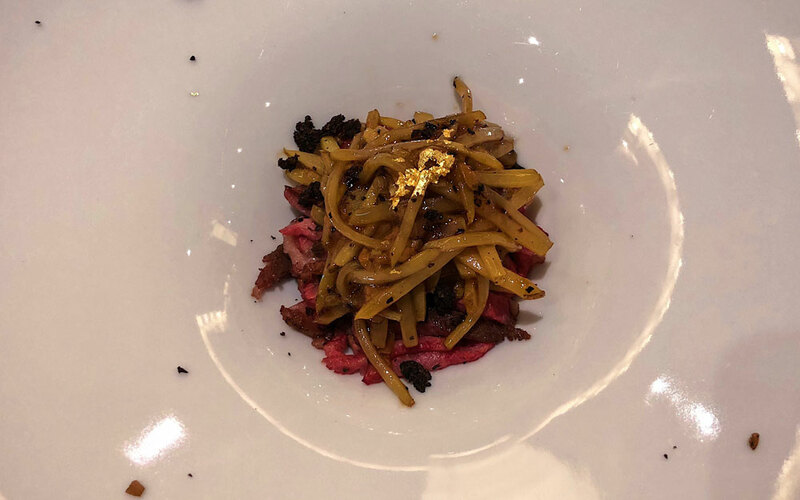 The truffle flavor finally provided an interesting taste for us, which felt late in the course. Dish number six was "steamed fish and omelet with soy sauce." I thought it had a nice presentation, at least compared to everything else we got. The deep fried kale, which you can kind of see in the background, was the biggest surprise for me. It was delicious and didn't taste much at all like kale. I suppose that's the magic of fried foods. I also thought the egg was a perfect consistency for the dish, which allowed it to soak up some of the other flavors around it. For plate number seven, we had another choice. I got the "noodle soup with shrimp." We were in main course territory. Yet, it felt more like a side or appetizer. 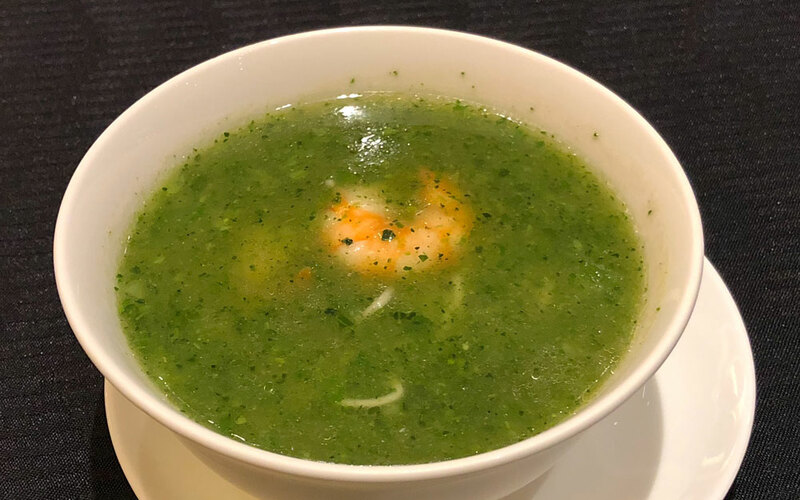 This was a weird soup for me. It was good, and I liked it, but we were in main course territory. Yet, it felt more like a side or appetizer. It was covered in a thick layer of oil (which, don't get me wrong, I thought was a positive), and had a fresh taste. But, if I ever came here again, I'd probably get the other option. Viet got the "minced pork & hot chili sauce," a.k.a. mabodōfu. That, my friends, is Chin Kenichi's famous dish, and he's really good at making it. I was excited for Viet to try it, and indeed his comment was, "That's the best mabodōfu I've ever had, maybe." Being a veteran of the Chin Kenichi Mabodōfu restaurant, I asked for a taste to see how the "fancy" version compared. It was almost the same, but for some reason I preferred the less fancy chain restaurant version. I think the flavors are stronger and spicier there. I convinced Viet to go to the mabodōfu chain restaurant where we stuffed ourselves until we thought we'd explode. 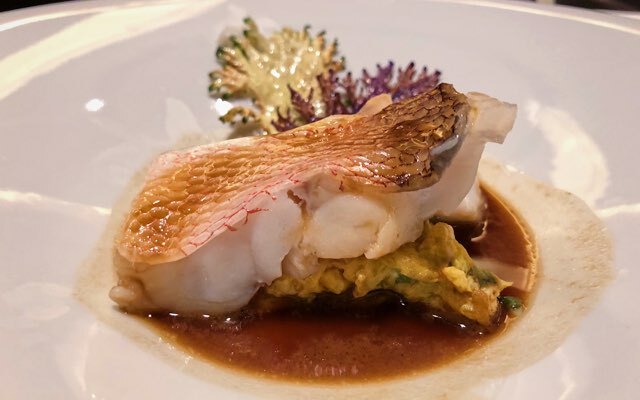 Check out the article to see which Kenichi mabodōfu Viet preferred. Now that we had finished all our foods, the next item on the menu was dessert. But, before dessert, they gave us a palate cleanser: some mango ice cream with mochi on top. This was good, tart, and a nice contrast to what we had been eating before (though I can't help but think it would have been better had the previous dishes been spicy). Still, there's no reason to complain about surprise dessert. After eating our palate cleanser, the real dessert came. The "gateau chocolate Japanese pepper flavor" was, by far, the most polarizing item on the menu for me and Viet. I loved it. Viet… wasn't a fan. 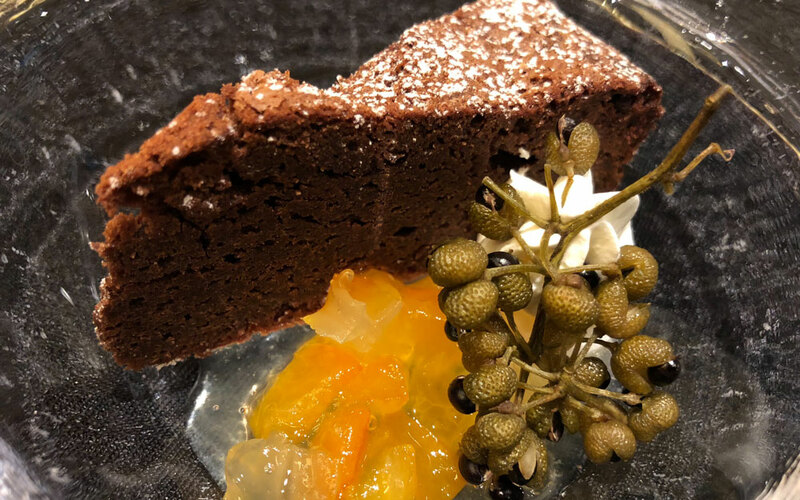 There wasn't anything particularly special about the chocolate cake, or the orange citrus-based jelly. It was the twig laying there on the side. I didn't know what it was at first, but after I put it in my mouth I figured it out. They were Sanshō peppers, the green variety of Szechuan peppers! These are a couple varieties, and are common in Szechuan cooking. Although their taste isn't anything to write home about, they have the unique property of numbing your mouth and lips, giving them a tingling sensation. Traditionally, this pepper is used so you can handle spicier foods. Szechuan peppers also bring out the bitterness in things. For something without much taste like water, it makes it taste awful and bitter. But, for sweet things like cake, it adds a new depth of flavor. I really enjoyed this dish a lot, and was surprised to see Szechuan peppers used in a sweet dish. For me, this is what saved the whole experience (more on that later), but for Viet, it just made a mediocre experience worse. Does this Iron Chef Restaurant Reign Supreme? Even without comparing Szechuan Restaurant Chin to the other Iron Chef restaurants, the experience for us was mediocre at best. 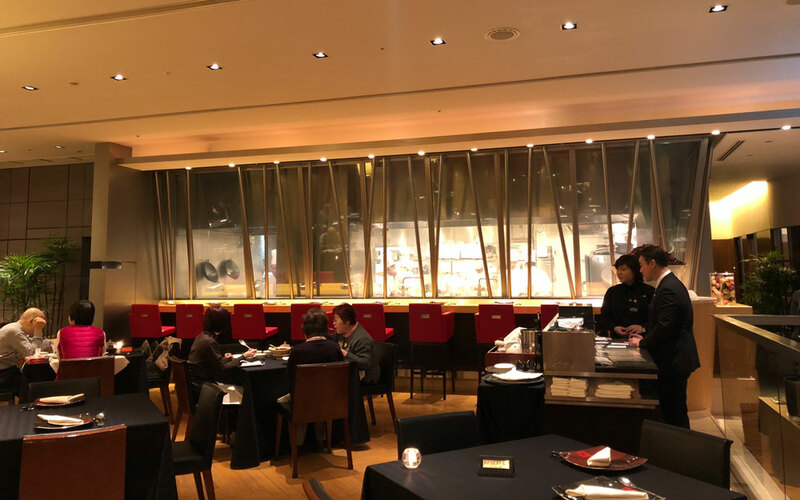 For a dinner that cost over $100 USD, it was not what we were expecting. Viet mentioned that maybe if it was $40, it would be okay, but either way I was not impressed. For Szechuan food, it lacked almost all the qualities that makes Szechuan food good. It was bland and not all that colorful. 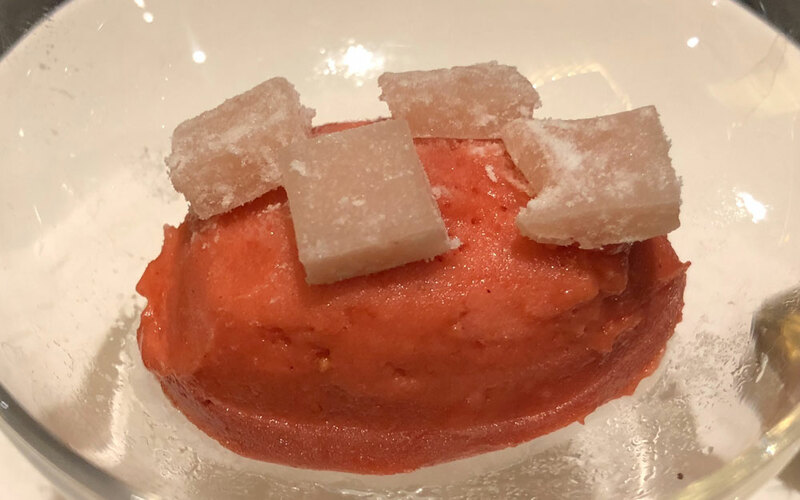 Even outside of this "Szechuan lens," I didn't think anything, except the dessert, was Iron Chef-caliber, whatever that means. I'd like to give the a la carte items in the menu a try in the future—some of them looked interesting, and spicy—but to be honest I just don't have the urge to go out of my way to eat here again. So for me, and for Viet too, it's difficult to recommend this particular Iron Chef restaurant. Perhaps Chin Kenichi needs to stick with the cream of his crop: mabodōfu. We rated his chain mabodōfu restaurant much more favorably, and it's one of my favorite places to eat when I'm in Japan. Szechuan Restaurant Chin, however, does not make the cut. 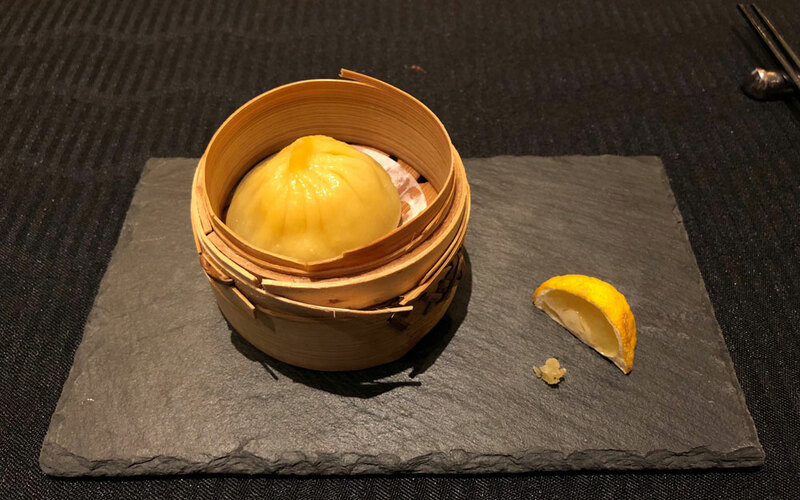 I wanted to like it so much, but other than the dessert and the yuzu xiaolongbao, I didn’t experience anything that really stood out as exceptional. When you’re paying this much for dinner, expectations are high, and unfortunately this time they weren’t met. Instead, spend your hundred-plus dollars going to his mabodōfu chain restaurant five or six times. I promise you’ll be happy! I had really high hopes for this place. Chen Kenichi was one of my favorite Iron Chefs back when I watched the show as a youngin’. One of his signature dishes which he always made on the show, the mabodōfu, was one of those food bucket list items. And now I’ve been given the opportunity to try it. It was my favorite dish out of the course set, but that isn’t saying much. 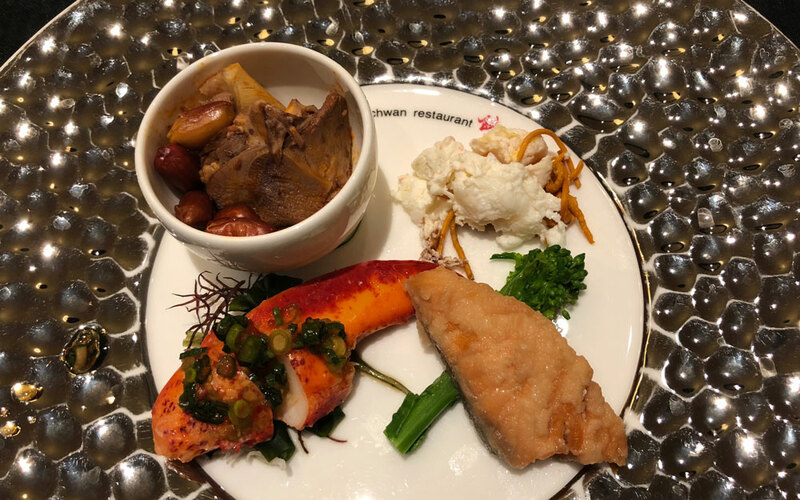 The rest of the food was bland—I expected more out of Chinese cooking, especially from a restaurant with Szechuan cuisine influences. You could see the chefs through a big window like they were a display at a zoo. A fancy place for fancy boys and girls. Perhaps it is more ideal to Japanese tastes, but the food generally lacked flavor, spice, and color. Quite expensive for the lackluster experience.